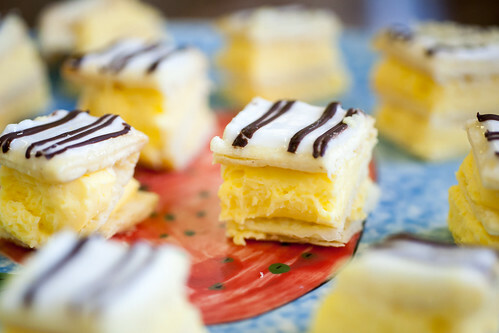 Custard Slices, a photo by BlackburnMike_1 on Flickr. I've not been feeling well this past week. Nothing serious, I think I was just a bit run down and my body was telling me to take it easy and have a few early nights. Anyway, one of the side effects of being ill this week was that I completely lost my appetite. I couldn't even finish a sandwich yesterday. But today my appetite came back. And it came back in full force with a sweet tooth leading the way. I found myself in two separate supermarkets today drooling over cream cakes. So in order to show you a photograph relevant to my day I went searching for desserts. A very foolish think to do though as now looking at this beautiful photo I find myself really, really needing a custard slice. Great photo, great baking!